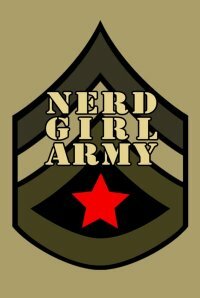 Sick of having to put up with clueless booth babes and a constant stream of male oriented content on geek blogs and nerd conventions Nerd Girl Army was founded as a place to share items of interest to geeks of all kinds. If you believe that the geek community has a place for women and that sometimes a cupcake and a puzzle game are just as good as bouncing bikini girls and zombie slaughtering then Nerd Girl Army has time for you. Not that we don't like zombie slaughtering, I mean what prepared geek girl doesn't have a World War Z plan? Nerd Girl Army will contain some of the usual nerd news that you'll find around other geek blogs but we're here to show off the Hello Kitty kawaii, dress up costuming, cooking geek and women in tech content that we find every bit as important as new API releases, big software updates and local community groups.